After two somewhat mediocre episodes of Glee, tonight's "Laryngitis" picked up the slack, and was a pretty entertaining episode from start to finish. Well, it was kind of like two episodes because the second half of the episode was very different than the first half, and we got tons of storylines and songs in such a small amount of time, but for the most part everything flowed. The common thread that ran throughout the episode was self-identity as Puck, Mercedes, Kurt, and Rachel try to figure out if they are more than what they seem. Is Puck just a cool bully? Does Mercedes feel comfortable in her Cheerios uniform? Is Rachel nothing without her singing voice? Is Kurt really gay? These are some of the questions posed by this week's episode; some are answered and some kicked off what's going to be a fun journey of self discovery. Puck's attempt to reclaim his cool status after losing his mohawk by dating Mercedes (she's cool now because she's a cheerleader) kicked off the episode, and this plotline delivered a lot of the laughs. When Puck tried to impress Mercedes by pointing out the fact the Sammy Davis, Jr. was a black Jew I couldn't help but laugh out loud. Also, seeing Mercedes let Puck use her for her popularity was both fun and sad. She finally had a boy show interest in her, and even though she knew what his motivations were, she was willing to let it slide because of the attention. I'm just glad she wised up by the end of the episode. While the Puck/Mercedes sub-plot brought the funny, Rachel and Kurt's respective stories brought the drama. Sure, Rachel losing her voice and Kurt trying to butch up for his dad had their share of jokes and light moments, but they quickly became serious. In order to calm Rachel down, Finn introduced her to a friend of his who was paralyzed and lost everything. While the gesture was pretty heavy-handed, the message sunk in, and Rachel realized that she's more than just her voice. The show has never been subtle, so I shouldn't have been surprised that they introduced a paralyzed character to make a point, but something about this storyline something felt a tiny bit forced. I'm glad that Glee continues to bring diversity and important lessons to TV, but Rachel's story kind of took the wind out of the sails which led to a very quick change in tone. It was a little jarring. 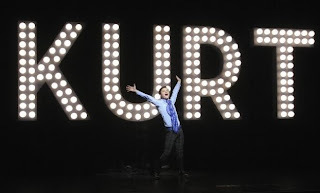 On the other hand, Kurt's storyline pretty much seamlessly combined comedy and drama. Kurt was still trying to come to terms with his dad spending time with Finn, so he decided to become more of a "man" in order to connect with Burt. Of course, this tactic did't really land, which just frustrated Kurt even more. We were lucky to get yet another amazing scene between Kurt and his father as they try to understand where the other is coming from. Who would have thought the guy from GUTS had such range? What makes Kurt's story so great is it could have Burt be 100% supportive and understanding. While he is 100% supportive of Kurt, there are some adjustments that Burt needs to make. He doesn't totally understand Kurt, but he loves him with all of his being, which makes their scenes have even more of an impact because they're willing to put in some extra effort to make their relationship work. Oh, and Brittany had more screentime and one-liners, which is always a good thing. As you can see, there was a lot of narrative going on during tonight's episode, but they're was also a ton of great songs. Finn's rendition of "Jessie's Girl" was probably the least inspired song choice ever (we all knew it was coming as soon as Jesse started dating Rachel), but it still worked as a performance and as a plot device. 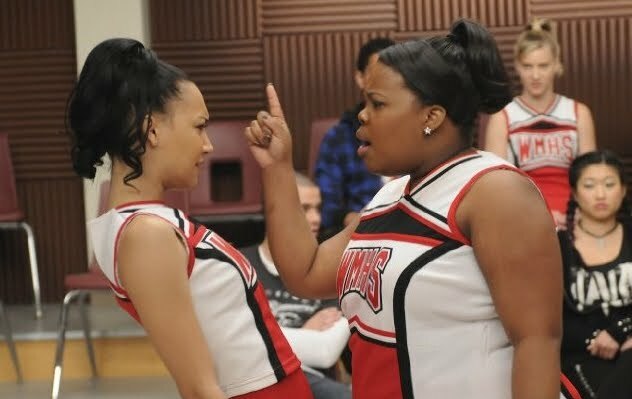 The duet involving Mercedes and Santana (they sang "The Boy is Mine") was great because it allowed Naya Rivera to really showcase her skills for once. Oh, and let's not forget Puck's version of "The Lady is a Tramp". Seriously, Glee needs a Rat Pack themed episode next season, or at least more jazz numbers. 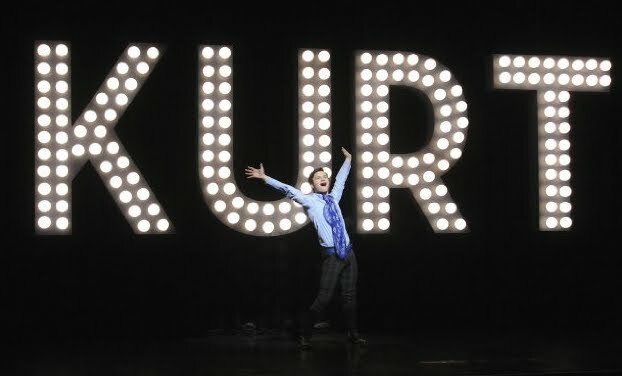 Kurt's Broadway inspired "Rose's Turn" was also moving. The only songs that really didn't work for me was "The Climb" (which was kind of the point I suppose), and New Directions' rendition of U2's "One". The last song worked from a thematic standpoint, but the execution just didn't have the same punch as some of the other show stopper numbers. "Laryngitis" was jam packed with plenty of story, character development, and great music, but it didn't feel too busy or jumbled like last week's "Bad Reputation" (maybe it's because we didn't have two music videos to sit through), and almost everything worked. I just hope Glee has gotten past its slump because I'd hate it if next week's Joss Whedon/Neil Patrick Harris episode is anything less than abso-freaking-lutely brilliant. << Next Episode: "Dream On"